Last week, on March 7, 1962, a violent storm struck the Atlantic Coast. Commonly known as the Ash Wednesday Storm, it affected the coast from Florida to New England. President John F. Kennedy declared a disaster area along the coast. Ocean City, Maryland sustained major damage when a 3-mile stretch of the boardwalk was wiped out and wind gusts hit 60 to 70mph. The high winds caused 40-foot waves and tides that ran 2 to 6 feet above normal. Overall, the Ash Wednesday Storm caused over $200 million dollars in property damage (in 1962 dollars) and major coastal erosion from North Carolina to Long Island, New York. The Red Cross recorded 40 people dead and more than 1,000 injured. Because it hit during a tidal period when the sun and moon are in phase, tides reached 9 feet above normal at Norfolk, Virginia. Besides coastal damage, heavy snows fell in the Appalachian Mountains. Big Meadows, Virginia recorded that state’s highest 24-hour snowfall, with 33 inches. It is still classed as one of the ten worst storms in the United States in the 20th century. An unusual lasting positive effect is on the National Park system. During the 1950s, over 5,000 private lots on Assateague Island were zoned and sold for resort development. The Ash Wednesday Storm halted the plans for development, destroying the few existing structures on the island and ripping roads apart with wave action. The undevelopable land was acquired by the federal government and in 1965, Assateague Island became a National Seashore. We’re nearing St. Patrick's Day, so here’s a quick look at some parades that have been around since at least 1962! Hope you can enjoy one of them next week. Columbus, Ohio St. Patrick's Day Parade – Monday, March 17, 2014 – The parade and other events are organized and funded by the Shamrock Club of Columbus and have been since 1936. This parade is on our US-23 route. Atlanta, Georgia St. Patrick's Parade - Saturday, March 15, 2014 – Another old parade, it’s been around since 1858! In 2011, Ireland’s Consul General was the Grand Marshall. Another parade on our US-23 route. Bay City, Michigan St. Patrick's Day Parade - March 16, 2014 - Bay City's parade began in 1955 and is also on our US-23 route. Chicago, Illinois St. Patricks Day Parade - March 15, 2014 – One of the most famous parades, held since 1957. The day’s events include dyeing the Chicago River green, which they’ve done since 1962! Newark, New Jersey St. Patrick's Day Parade - March 14, 2014 – Billed as New Jersey’s first, it’s now in its 79th year. Scranton, Pennsylvania St. Patrick's Day Parade - March 15, 2014 – Begun in 1962 by the St. Patrick's Parade Association of Lackawanna County. This one claims to be the second largest parade in the country, as measured by participants per population of the host city. Savannah, Georgia is first and New York City is third. This city is on our US-6 journey. Montauk, New York St. Patrick's Day Parade – Another parade founded in 1962. Houston, Texas St. Patrick's Day Parade - March 15, 2014 – This event dates back to the 1880s, but has been interrupted several times since. It started in "Irish Town" by old St. Patrick's Church and originally continued until World War I. It was revived in 1960 by local radio personalities, Tim Nolan and Bob Bryant and has since grown into one of the city's largest parades. Looking at comic books at your local store or online today, you might think that comics have always been dominated by superheroes. But superhero comics were actually the minority in 1962. Titles covered a much broader range of genres, including romance, humor, tv shows, popular cartoon characters, science fiction, horror, war, westerns, and even propaganda and non-fiction. Superheroes were mostly confined to Batman and spinoffs of Superman. The Flash and Green Lantern had been resurrected after several years of dormancy, but Spider-Man would not appear until June 1962. 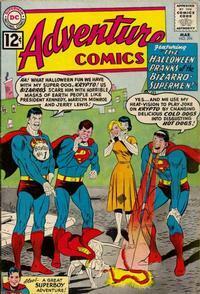 As this cover from Adventure Comics #294 shows, sometimes even Superman titles were not truly superhero stories. If you’ve ever wondered what kinds of candy you could buy in 1962, I have a treat for you. You can discover candies you can still buy, along with some that are no longer available. Go satisfy your sweet tooth! On March 14, 1962 Detroit Red Wings hockey player Gordie Howe became just the second NHL player to score 500 goals. The goal came against New York Rangers’ goalie, Lorne John "Gump" Worsley. Despite the record, the Rangers went on to win the game 3-2. This was Howe's 1,045th game. The first player to hit 500 was Maurice Richard in the 1957-58 season, in just 863 games. Roadtrip-'62 ™ ’s westward trip down US-6 enters another new state today, as we skirt the edge of the Chicago metropolitan area. For Day 18 of the trip, we take a look at the last of Indiana and begin Illinois, with an emphasis on the older suburbs of Chicago, and end the day at Joliet. Not exactly a blog, but a great resource if you are even just a little bit interested in the decorative concrete blocks that were popular in the 1950s and 1960s. Many homes were built with these at the front entrance or carport, and some sported entire fences constructed of them. The number of patterns seems endless, and Jack LeVine at VeryVintageVegas has attempted to catalog them all. Maybe you’ll find some design ideas. Join me for Day 14 of our US-23 journey, as we travel through some of my favorite territory: the Smoky Mountains of North Carolina. We begin at the magnificent Biltmore Estate in Asheville. The Flint Institute of Arts is a small art museum, but they feature both an interesting permanent collection and monthly exhibits. The museum is located in Flint, Michigan on our US-23 route and opened in its current location in 1958, so our 1962 journey would have seen it in nearly new condition. Its twelve galleries still look great today. Exhibits span the whole range of art, from classical, Asiatic, African, and expressionism to sculpture, glassware, modern, and pop. One of my favorite permanent displays is a sculpture in glass and colored light by Stephen Knapp, set on their theatre stage. Portsmouth, Ohio St. Patrick's Day Parade from 2011. Featuring some fine bagpipers heading right down US-23 to Tracy Park. St Patrick's Day Parade, Denver, CO - Saturday, March 15, 2014. This is Denver’s 52nd annual parade, having been founded in 1962. It has a decidedly Western style to it, including a herd of longhorn cattle!